A lot of us here, in Canal Studios, started in the kitchen table or looked for free places to work. When you start a business or as freelance it's challenging to start renting, because your income isn't steady, just yet. This is a great place to work and hold a meeting with your new clients. Their lobby is glamorous and comfortable with sofas and tables. They also have a nice restaurant at the back with excellent food, coffee and juices. It is located in the heart of Shoreditch, with lots of places around for an after work drinks and cute independent shops to window shopping at your lunch break. Google campus can get quite busy, so it's best to go early. This place is excellent because it isn't accessible if you are not registered, which makes it safer. A lot of young entrepreneurs spend their days sitting and starting up their new businesses. You can also go to their free talks and workshops. It's a fascinating place that you can get a lot of value from it, at no price. 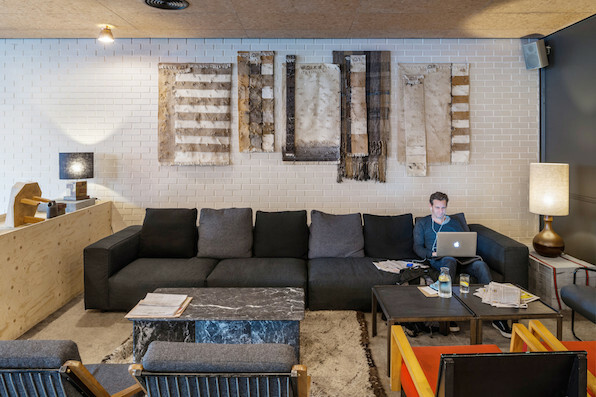 Similar to Ace Hotel, it's an excellent place to work and hold meetings. You can sit there for the day without getting any dirty looks. A lot of sockets to plug your laptop and comfortable sitting to have a right concentration and not end up your day with back pain. Oh, this is possibly one of the most inspiring places to work from. With lots of sitting, you can spend the day in a perfect location that will give you space for work and meet with clients. At the heart of King's Cross, having a lot of nice places for drinks and food, including a pleasant lunch walk by the canal. At the heart of the city, one of the most incredible places in London is The Barbican. A lot of sitting and quiet corners to find calm and concentration.